NEXT DOOR INTERNET CAFE, GUERRERO ST. - Within this computer shop a melee is unfolding between the boys of Class 2010 and Class 2011. I was too late to join the fight. If I were five minutes early, by now I would've been gearing up my thunderbolts as Zeus, the Lord of Olympia. The Greek god of gods is not supreme, however: Lucifer can be a formidable enemy. 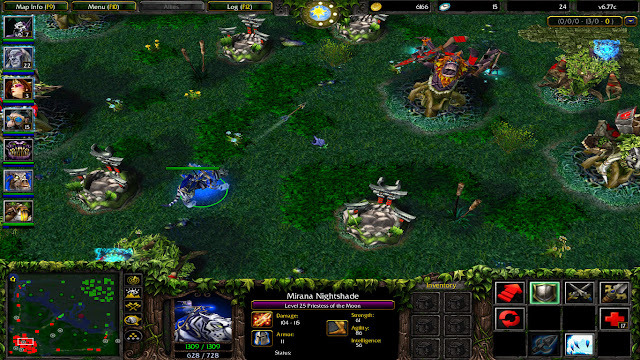 Enter the world of DOTA, the latest successor to the LAN games throne. With almost 80 characters to chose from, each with a unique 'personality', the possibilities are endless. It combines the mystical environment of Warcraft, the intensity of an role-playing game like Ragnarok, and the tactical excitement of Counter-Strike to create an opium for the boys – and girls too! The phenomenon of computer gaming, like a drug-resistant virus, easily infiltrated our supposedly-immune-to-fun College of Medicine. In Class 2010 where I belong, roughly 30% of the guys play DOTA; the figures go higher for the more benign lower batches. While their classmates were applying for fraternities, the DOTA players in 2010 have formed a clique, which they dubbed PHI DOTA MU - perhaps this is a way of saying that in computer games, as in the fantasy worlds they bring to life - and like Greek-letter fraternities - a special bond of camaraderie exists among them. Games like DOTA have doubtless helped to make the 21st century male more and more cerebral. Whereas the medieval crusader would take a lifetime to learn how to defeat his enemy Moor, I only have to click the mouse to kill the devil himself. And if I die, it will just take a minute for me to get back to the field again. Woe to the ladies though, who would have wished a much more glamorous male: the perspiring, muscular athlete is now the chuckling, C2-drinking guy with glasses. Not everyone will have their names chanted at the Biochem court while an interclass basketball game goes on; not everyone will claim the distinction of a College Scholar. But in DOTA, everyone’s equal: neither muscles nor memory can give you the edge, only experience. Of course it is a non-entity when it comes to credentials: being the best DOTA player in the College won’t land me a slot in Surgery. But it will make me much happier than if I’m reading Robbins. Can you beat that? Computer games will not replace sports and outdoor activities; I still consider it a sacrilege to exchange a hike up Mt. Ugo for two days of DOTA. But do I have two days? A med student is lucky to have two hours. Philosophical meanderings aside, DOTA is a great game, a great detox activity. We may desire to climb mountains or play ball, but a ward summons or a sudden rain can ruin everything. There's always DOTA, though. It’s just next door, within the Ladymed’s sight. As Iskolars ng Bayan, we are perpetually asked to be heroes of the nation and act like adults, healers, five-star physicians. Tall order for someone like me, who remains nostalgic over high schools days when we skipped classes in order to play Starcraft. Sure, I may turn out to be somewhat heroic. But for the time being I can shrug off these weighty challenges for a while and go to our virtual playground, where we can all be heroes and forget about the next Pathology exam. I could write more. But I’ll have to wrap this up. The next game is about to begin!